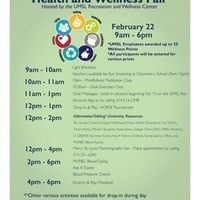 Join us at the UMSL RWC for an all day Health and Wellness Fair. UMSL Employees can earn up to 25 Wellness Points. UMSL Employees can use the RWC for FREE all day! All participants will be entered for various prizes.